A relaxing week far away from home is soon coming to an end. Relaxing time away means a lot of reading and writing. I am for the moment reading three books. One book is the second book in a trilogy written by the Swedish author Jan Guillo. It is about three sons of a fisherman in Bergen Norway around the year 1900. The father dies in a terrible storm and the three young boys are making their ways out in the world, meeting all the modern inventions and political, cultural changes of the new century. This is a typical vacation books for me. A book I can read for pure entertainment. I think that Guillo is a good story teller and I have read most of his books. The second book I am reading is a totally different one. Ruth and myself will soon speak at a Leaders´ Conference about Postmodernísm and the Emerging Church. In preparation for that conference I am reading Brian McLaren´s book “A new kind of Christianity”. I am very critical to the thoughts of the Emerging Church and how they contradict Salvation Army Theology. I have written a lot about this earlier and I will also comment the book more on detail on my Swedish blog. The third book I am reading is a book by Barack Obama about his background and life. Very open and interesting reading! He writes a lot about his search for his own identity having a black father and a white mother. He wrote the book some time before he became president and seeing him in action today makes it difficult to believe the shy, insecure, disoriented young man he used to be. During the week I have also been engaged in the work of producing a new book for the five year anniversary of the think tank, the Clapham Institute, in February. I have been in the board of the institute since it started. The Clapham Institute has got its name from the group of Christian people, meeting in Clapham outside London. The influence from this group contributed to the decision to end slavery in the beginning of the 1900th century. The manuscript must be handed in to the printing company next week, so time is short. During the week I also discovered a new facebook-site with the aim to change the Salvation Army view about membership and officership also for active homosexual people. The group has received financial support from the state to change the Salvation Army view in these matters. I am very surprised that the state pays one group to change the values of another value based organization. I will write much more about this next week on my Swedish blog. If you want to now more about this you can “google translate” my comment on Tuesday. You will find it on www.rupeba.se. But now it is soon time for at new week back in Sweden. Another week! We have been busy moving also this week Many things have to be unpacked and rediscovered and sorted. This is the 12th place weare living since we married. Moving is a hard work and it is not getting easier and easier. For now we live at a Salvation Army School Home, half an hour northwest of Stocksholm, beautifully situated on an island in the big lake Mälaren. This week I have also been working with a book project for the Clapham Institute. I am since some years a board member in the Institute. The Clapham Institute is a think tank and a research institute aiming to stimulate education and scientific research about Christian Faith. In February the Institute is celebrating five years of work and for this occasion we are producing a book with articles written by the fellows in the Clapham Institute during these years. The coming week we are planning to go away for one week of vacation. We will soon retire and I have heard that retired people do not get vacations, so we better take vacation while we are still employed. Next week I plan to do as little as possible. I pray that you will have a blessed week. Another week! This week we have mainly been spending carrying boxes and furniture. We have also spent a lot of time unpacking boxes, finding things we had forgotten we had, that have been stored for more than three years. Moving is a tough and exciting work. Latvia feels almost unreal now. Our daily evening walks down Bibibas Street, through the old town of Riga, to the Daugava river, where we used to have our evening prayers.It was so natural and familiar then, but now it feels like memories from a different world. 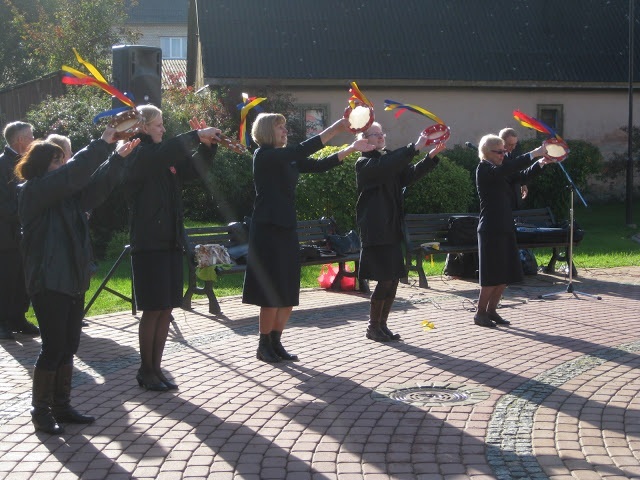 We still get reports from Latvia and it is encouraging to see that the Salvation Army in Latvia keeps growing and expanding. The Russian speking corps in the very southeast of Latvia experiences a dramatic growth. 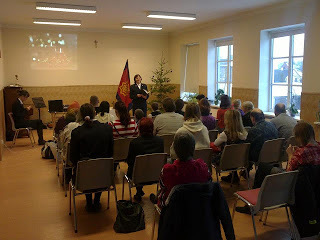 We received some pictures from the Christmas celebration at Daugavpils corps. HERE you can see more pictures from the Christmas celebration at Daugavipils corps. Last summer we opened two new corps plantings. One of them, Saldus, is a place were the Salvation Army never has had any work before. Our opening meeting in September was an open air meeting since we by then have not been able to get facilities. 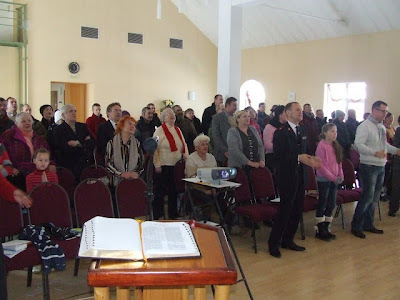 This last week we also got reports from the first indoor meeting in Saldus in the new rented hall. You can see many more pictures from that meeting HERE. We pray that the growth in Latvia will continue and that the Kingdom of God will keep growing in Sweden, Scandinavia, Europe and till the end of the world.